No Ticket need to be booked – You can just turn up on the day! Includes a guaranteed reserved seat and priority VIP entrance and VIP toilets. Includes 2 Mass (1.5 pint) of FestBeer, 1 glass of Schlumberger Sekt, VIP meal and a German Schnapps shot Underberg. In addition, there will be a welcome Brezel plate. We offer corporate tables on our Corporate Page. Seats will be filled starting from the front. 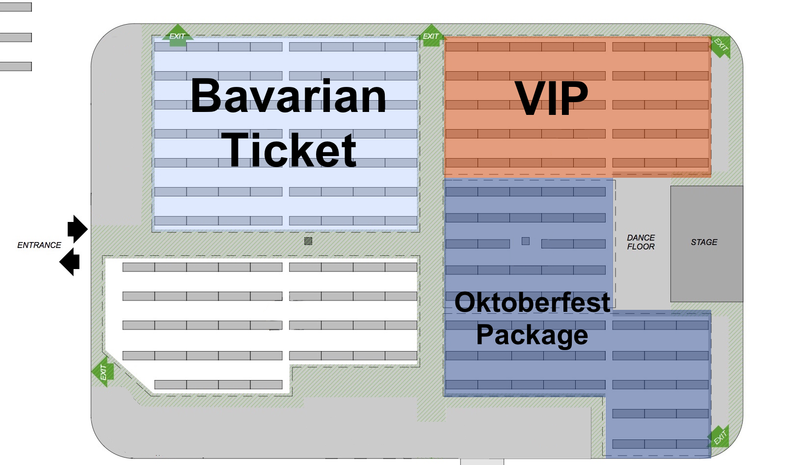 That means the earlier you book the better seated you get at the Aberdeen Oktoberfest. Booked seats must be taken before 18:30 on Thursday, Friday and Saturday Afternoon before 14:00. For the Saturday evening session you have to be there before 19:30. If you want to come later and be sure of your seats book one of our VIP-packages.